What a wonderful way to spend a day! A big room full of young mystery fans and their parents. Four other great mystery writers all giving talks and workshops - and in between - sitting chatting, having fun, eating cakes and comparing notes. A wonderful venue in the lovely seaside town of St Annes on Sea, organised by the amazing Storytellers. Inc bookshop. 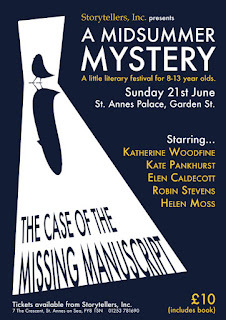 And, if that wasn't enough, a mystery-play written especially written for the day, with actors playing the parts, and the authors all joining in as the suspects.